Karl Lagerfeld, a famous fashion designer who was the mastermind behind leading brands like Chloé and Fendi, passed away at the age of 85 this past February. On Feb. 19th, 2019, the fashion industry lost a world-renowned designer and visionary. Known for his platinum white hair and dark shades, Karl stood as an eminent, and partially intimidating, figure in the fashion community. Karl was born in Hamburg, Germany, in 1933. Even as a young boy, Karl had a strong affinity for fashion. He would always keep up with the latest designs and collections in fashion magazines, and he spent a good majority of his time sketching out dresses that he hoped to one day bring to life. At just 14 years old, Karl moved to France alone to study abroad. 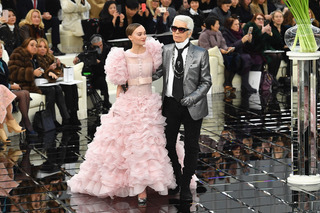 Being in Paris, one of the major fashion capitals of the world, this was Karl’s best chance to finally immerse himself in the fashion community. Karl Lagerfeld was a major figure in the fashion community, and his work stood and will always stand as an example for future designers. It’s really up to one’s own personal judgement to decide whether or not Karl’s actions should invalidate all the praise and recognition. Either way, Karl will forever live in history as an avant-garde designer who helped the fashion world blossom into much of what makes it chic and eye-catching today.